The process of choosing the right baby room rug can be a bit mind-blowing. There are so many to choose from, where do you start? If you already know what type of nursery room rug you want, visit our Nursery Room Rugs Store. The first thing you need to think about, is whether or not you need a natural fiber rug. If your family has a history of allergies or if you are planning an organic baby nursery, a natural fiber rug is essential. Nursery area rugs are available in a range of natural fibers including wool, cotton, sisal, jute and seagrass. For more about natural rug fibers, click here. Synthetic backings will off gas hazardous chemicals, defeating the purpose of using a natural fiber baby nursery rug. Natural rubber will not off gas. Consider buying a rug with no backing, and use a rug pad instead. If your baby has allergies, you will want to wash your rug often to remove dust and other pollutants. A backless nursery room rug can be easily machine washed. Any chemical treatment will result in off gassing. Wool, sisal and seagrass are naturally dirt and stain resistant and are good choices for a baby room rug. Again, chemical dyes will release hazardous pollutants into the air. Choosing a nursery rug that has been vegetable dyed is a better option. Although vegetable dyed fibers are not as bold in color as synthetically dyed fibers, there are still a fair variety of colors to choose from. 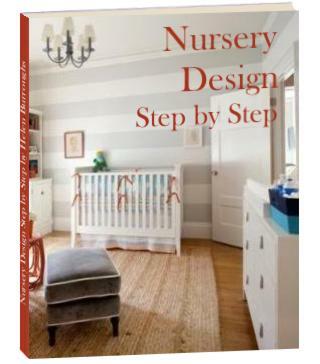 Or choose a neutral color and use other nursery decor items to bring out the accent colors in your baby nursery. Of the natural fibers, wool and cotton absorb dyes the best. Rugs made from the remaining natural fibers are usually left undyed, and are, therefore, only available in a range of natural, neutral shades. You and baby will want to crawl, roll and play all over the floor in the coming years. A coarse, scratchy surface could really ruin your fun. Baby also needs a soft surface to cushion his fall from the inevitable tumbles and bumbles of the early years. A large nursery area rug is perfect for this. Of the natural fibers, wool, cotton, and seagrass are the softest. Synthetic fibers are usually blended, so the softness will vary from rug to rug. Because of all the spills and messes that are likely to occur in your baby nursery, you should look for a rug that can be easily cleaned. A short pile or flat weave rug is far more user friendly than a shaggy rug in a baby nursery, and fringes and tassels are just asking to get grubby. Of the natural fibers, wool, sisal and seagrass resist dirt and stains and are easy to wipe clean. Nylon and polypropylene have the same properties and are often included in synthetic blends resulting in an easy clean baby room rug. Your rug will absorb dust, baby messes and other pollutants at a rapid rate. It will also breed dust mites if you give it a chance. Ideally you should be able to bung it in the washing machine with no worries about how it will come out at the other end. Obviously this is only possible with certain rug types. Rugs with backing are inflexible and, therefore, much more difficult to wash. Try to find a rug without a backing and use a rug pad to prevent slipping. Rug types without backings include knotted, flat weave, and braided rugs. Cotton, cotton blend and most synthetic rugs are machine washable. See more on cleaning your baby room rug here. Slippery surfaces are very dangerous for little ones taking their first wobbly steps, as are rugs with wrinkles or a knobbly surface. Look for a flat surface that is slip-resistant. Cheap synthetic blends can be deceivingly smooth and slippery. Make sure to look at nursery area rugs through the eyes of an inquisitive one year old. Fringes and tassels are a tripping accident waiting to happen and are best avoided in the baby nursery. Make sure to use a rug pad if the rug you choose does not have a non-slip backing. One of the most important factors when choosing an area rug is to get it the right size. In the baby nursery, there are special safety concerns affecting the optimum rug size. These need to be taken into account in addition to the normal interior design guidelines. Read more about how to choose the right size nursery area rug here.